It was a game of firsts. During the 1920 World Series one of the unusual contests took place in game five as the Cleveland Indians defeated the Brooklyn Dodgers 8-1 on Oct. 10. There were three things that happened for the first time in the history of the Fall Classic. Elmer Smith, Jim Bagby and Bill Wambsganss had their moments of baseball history as they led the Indians to the win. Smith had an impact in the bottom of the opening frame as he blasted the first grand slam homer in the history of the World Series off Brooklyn’s Burleigh Grimes. With the score still 4-0 in the bottom of the fourth, Bagby became the first pitcher to homer in series play as he took Grimes deep with a three-run shot. In the top of the fifth, the first two Dodgers reached on singles before Bagby got pinch-hitter Clarence Mitchell to hit a line drive to Wambsganss, who turned the historic triple play by himself. On the mound, Bagby wasn’t really dominant as he surrendered 13 hits, but the Dodgers didn’t get a run until the ninth inning. The Indians would go on to win their first World Series five games to two over the Dodgers, who were also known as the Robins during that time. It took 16 more years before Tony Lazzeri of the New York Yankees would hit the next grand slam in the 1936 series. There have been 18 since 1903 with the most recent coming in 2005 when Paul Konerko hit one for the Chicago White Sox against the Houston Astros. Since Bagby connected for his homer, there have been 14 other long balls hit in series action. Bob Gibson of the St. Louis Cardinals became the first pitcher to hit two homers when he had one in 1967 and another in 1968. Dave McNally soon joined Gibson with a pair of homers. After hitting his first in 1969, Dave McNally of the Baltimore Orioles became the only pitcher to hit a grand slam in the 1970 series against the Cincinnati Reds. 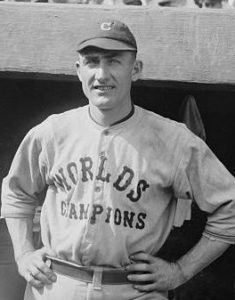 Since the first modern era unassisted triple play in 1909, there have been 14 others, but only Wambsganss has turned one in the World Series. The most recent was executed but Philadelphia Phillies second baseman Eric Bruntlett in 2009 against the New York Mets. 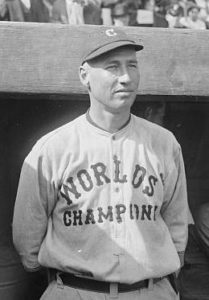 Smith bounced around in the majors for 10 seasons from 1914 to 1925 as he played for the Indians, Washington Senators, Boston Red Sox, New York Yankees and the Cincinnati Reds. During his second stint with Cleveland in 1920, Smith had 12 homers with 103 RBI, while batting .316. He also added 10 triples. Bagby pitched for nine years in the majors with seven of those seasons in Cleveland. The right-hander was with Cincinnati in 1912 before playing for the Indians from 1916 to 1922. He ended his time in the big leagues in 1923 with the Pittsburgh Pirates. He was 127-89 in his career, but in 1920 he led the American League with a 31-12 mark. 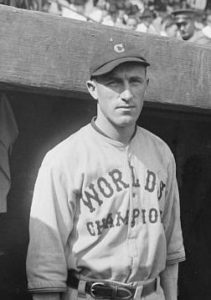 Wambsganss played 13 seasons in the majors with most of his time in Cleveland from 1914 to 1923. He was finished in 1926 after two years with the Boston Red Sox and a final season with the Philadelphia A’s. The 1920 season wasn’t really much to talk about for him as he batted .244 with one homer and 55 RBI, but he is certainly remembered for his triple play. No story about the 1920 Indians can be told without mentioning Ray Chapman. Chapman died one day after getting beaned by Carl Mays of the New York Yankees in August. He was replaced in the lineup at shortstop by rookie and future National Baseball Hall of Fame member Joe Sewell.